Lumber and fur are what first brought the white man to do business in what is now Tacoma, Washington. White settlers followed soon thereafter. Lumber, fur, and other goods were transported first by sea, and eventually by both sea and rail. Located right on the banks of Puget Sound, a fishing industry also emerged. 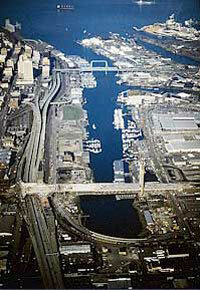 Currently, Tacoma is not known for its fishing industry. However, as a port city with significant freighter, tug boat, and other commercial traffic, there are men and women working aboard vessels doing work that is often dangerous. If you are employed to work on a vessel and are injured on a vessel while in the Port of Tacoma, you can contact the attorneys at nearby Stacey & Jacobsen, PLLC to make certain that your employer is covering your maintenance (basic daily stipend based on the costs you’d incur while employed on the vessel), cure (reasonable medical expenses until maximum medical recovery), and lost wages (your wages through the end of your contract). We’ll also listen to your story in order to rule out employer negligence and unseaworthiness. Whether our injured seaman clients are injured at sea, in a port like the Port of Tacoma, or in the countless towns and communities that dot the North Pacific landscape, our firm can provide the expertise and resources to ensure that you are adequately, properly, and aggressively represented. The attorneys at Stacey & Jacobsen, PLLC have over 75 years of combined Jones Act and General Maritime Law experience. If you have been injured and want to know more about your rights and how to protect your rights, contact us for a free consultation.